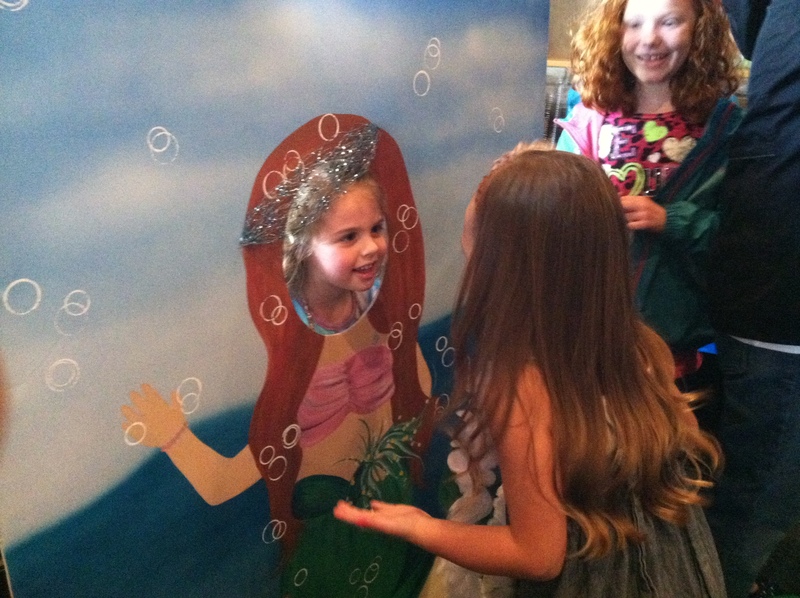 The Birthday Girl at her Under the Sea Little Mermaid Party! 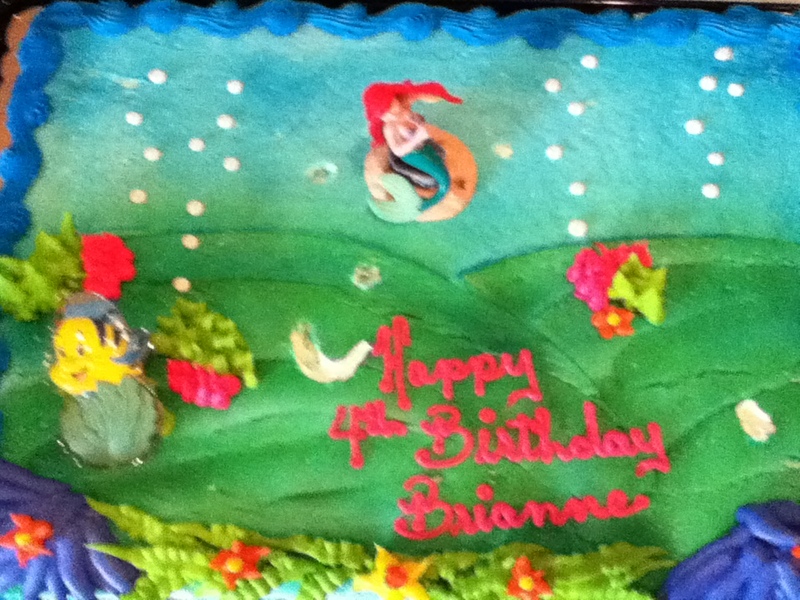 When Brianne asked me for a Little Mermaid party for her 4th Birthday, I was all in. I loved that movie as a kid, and now she loved it. Too cool. Load that on top of a sentimental need to mark her birthday with the fact that I love to plan parties and you’ve got one heck of a birthday celebration for a four year old. Call me crazy, and I probably am a little, but I LOVED every minute of planning Brianne’s Birthday party. Most likely more than she did. Her party became such an event, that we bonded just planning for it. 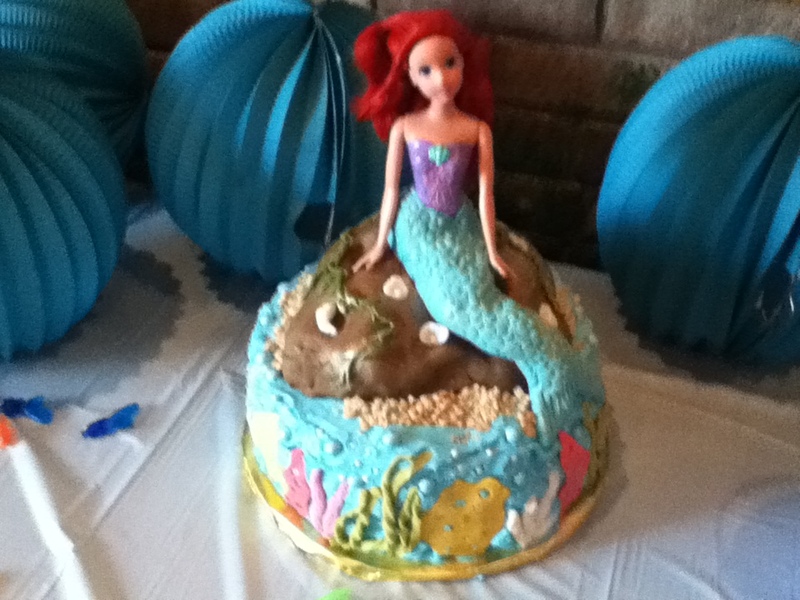 Best Little Mermaid cake, ever! After scouring the Internet picking out ideas from other Little Mermaid parties and organizing them into a Pinterest folder, we began tackling one project at a time. Passing out invitations at school that were rolled up like messages in a bottle. Picking out decorations to make her party look like it was on the bottom of the ocean. 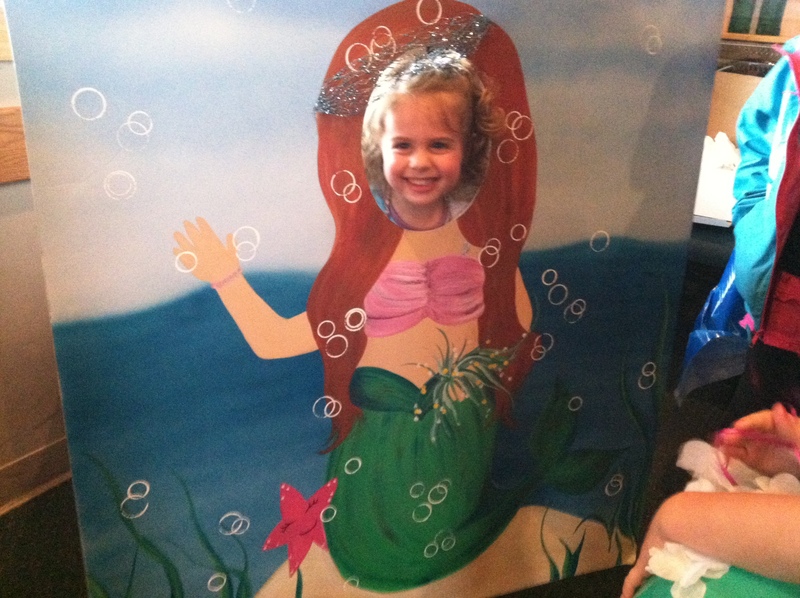 Grandma (this is where the gene pool comes into play) having an artist make a toddler sized stand up cut out of a mermaid for the kids to take pictures with …and showing up with boxes of ‘under the sea’ treasures to load in goodie bags for her friends. Not to mention the very talented friend of hers that made the most incredible Little Mermaid cake to match a picture Brianne picked out off the Internet. When the day finally came, she and her best friend set up the games she had picked out …dolphin ring toss and fish bean bag toss …and planted the beach balls we had blown up for everyone to play with. 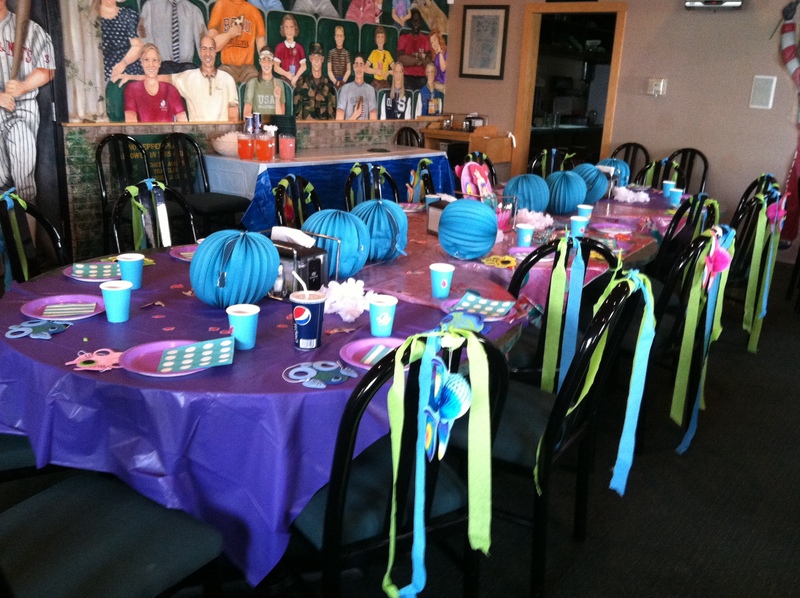 Meanwhile, I tasked my family and a few friends to attack the kids chairs with blue and green streamers to make it look like seaweed, while I set up the purple and blue colored table cloths, plates, and cups. The paper lanterns acting as sea bubbles on the table was one of my favorite ideas. 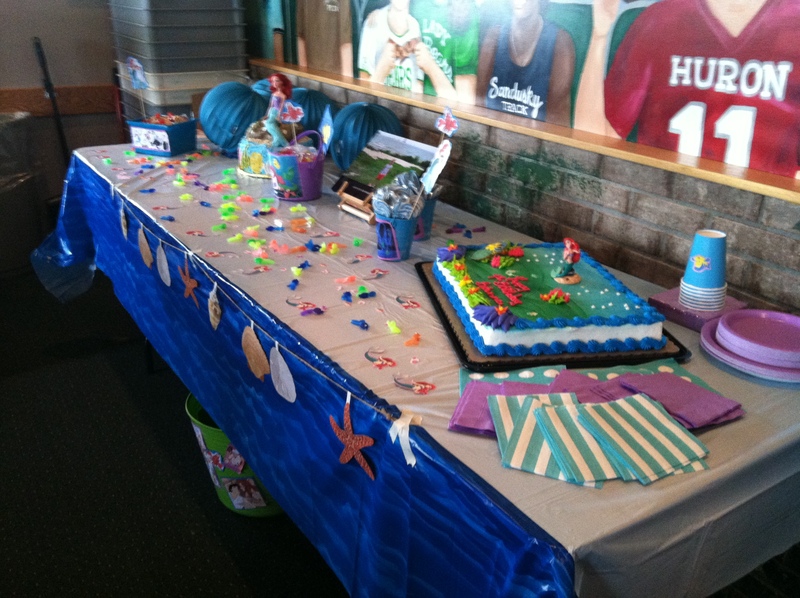 Brianne and her BFF covered the tables with Little Mermaid confetti and little plastic fish…and fish masks for each place at the huge kids table. We even had The Little Mermaid movie playing on the wall in the background. It was awesome. 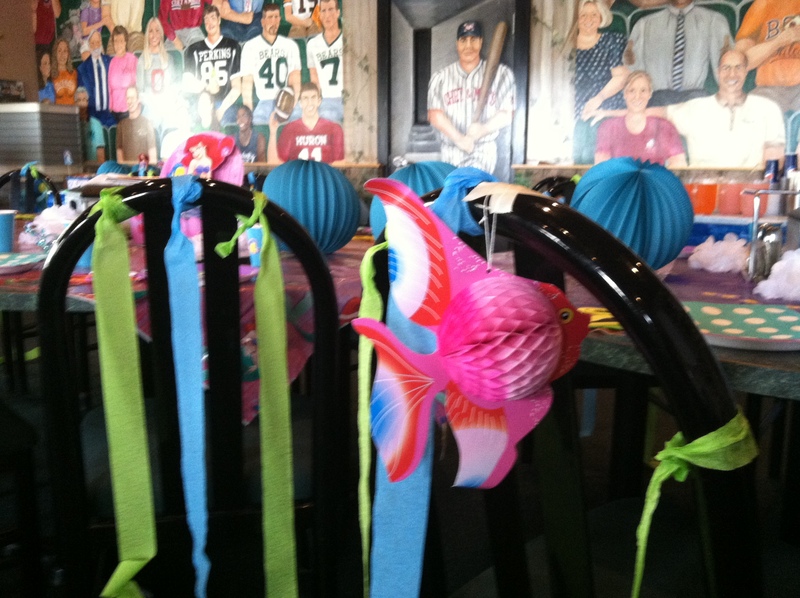 It was as much fun to decorate as it was to watch the kids whip beach balls at each other when they showed up. I have two girls, so I was definitely not ready for wrestling boys. 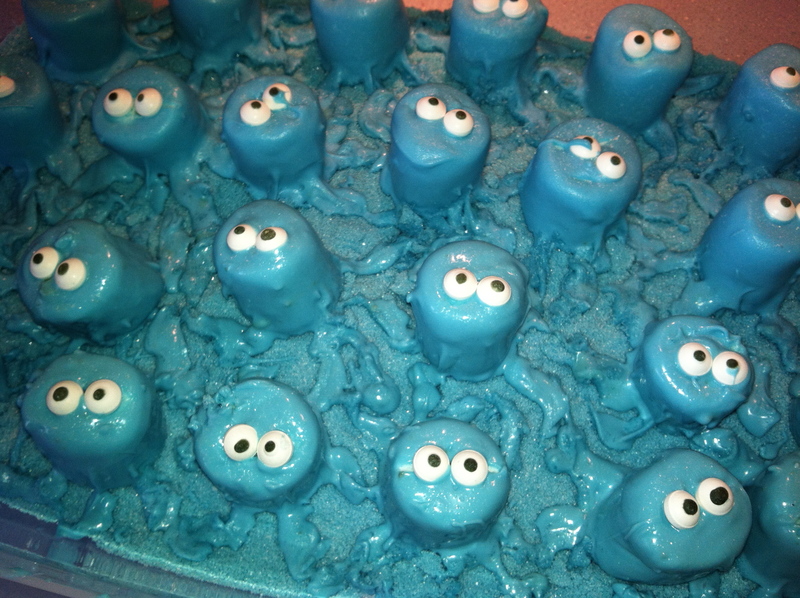 Add macaroni and cheese pizza and sugared up birthday cake to 25 pre-schoolers and madness ensued. Brianne had to show all her friends what a good runner she was, and made 50 laps around her own birthday party. One might say ….shoot, even I said …that this is what happens when you spend too much time on Pinterest. Really, though, I would do it all over again in a heart beat. 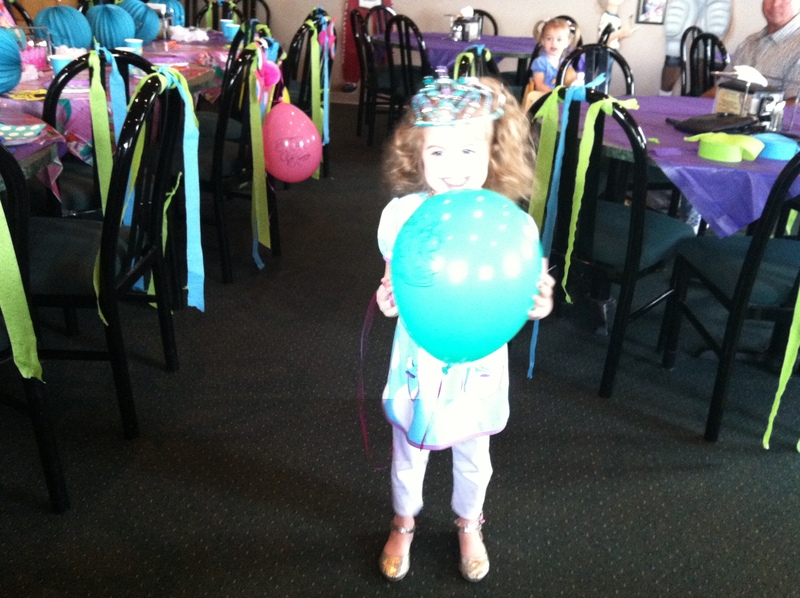 Brianne loved everything, from her color coordinated outfit and tierra to match her party, down to the balloons and shell whistles. She let all of her friends help her open her presents, and hugged each person after she opened her gift. She’ll talk about that party all year. 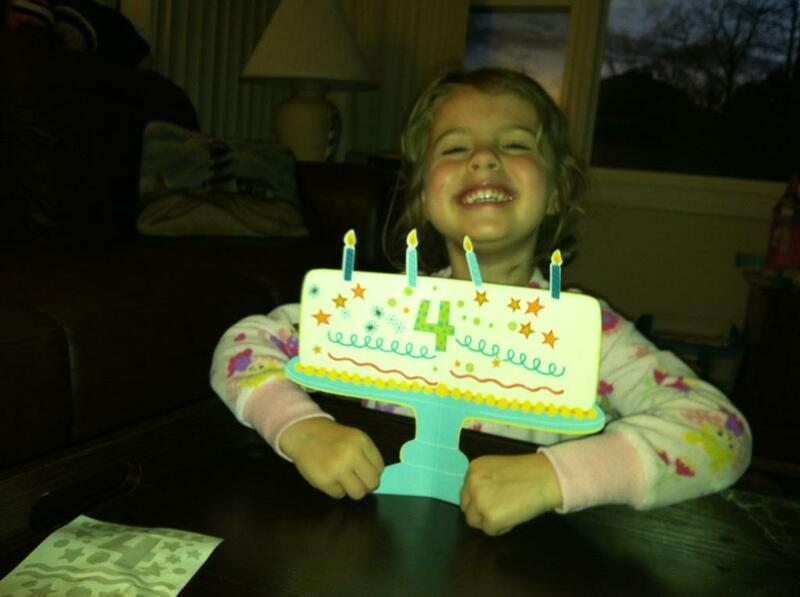 We’ll all remember when my baby turned four. ( Which is great, because I’m not sure we’ll be hosting 25 pre-schoolers ever again!) I self-admittedly get carried away with just about everything …but it sure does make for some great memories. I hope that when Brianne looks back someday she’ll realize that all the effort is out of love for her. It may appear that she’s spoiled …and she is …with my love. I’d do anything for her…even make 30 marshmallow octopuses with candy eyes and legs for her birthday treat to take to school. Hey, they’re only little once. Bring it on, Pinterest. April, 2019, and Brianne just turned 11. Though much has changed, she is still in love with ocean and The Little Mermaid. She wants to be a marine biologist, and we are still best buds. It is getting a little trickier as she grows up and reaches for independence, but I am still all in. I’m so grateful I started this blog to remember all of these moments, and glad I took the time when I had the time to “go big.” Time is speeding up, now, and she is almost as tall as me. She dreams big and works hard, and I love to encourage her. Brianne, most importantly, loves Jesus, which brings all who know her joy. Happy 11th Birthday, to my beautiful ballerina, kind-hearted trumpet playing kiddo and future marine biologist. Previous Post The Ice Cream Stand. Next Post The Big Girl Bed. Welcome to Sunny&80 …a purposeful shift in perspective to love the people in our lives, regardless of the forecast.